Let’s face it: Leaders of the world are pretty limited in what they’re allowed to say — at least, they are if they don’t want to receive massive pushback. 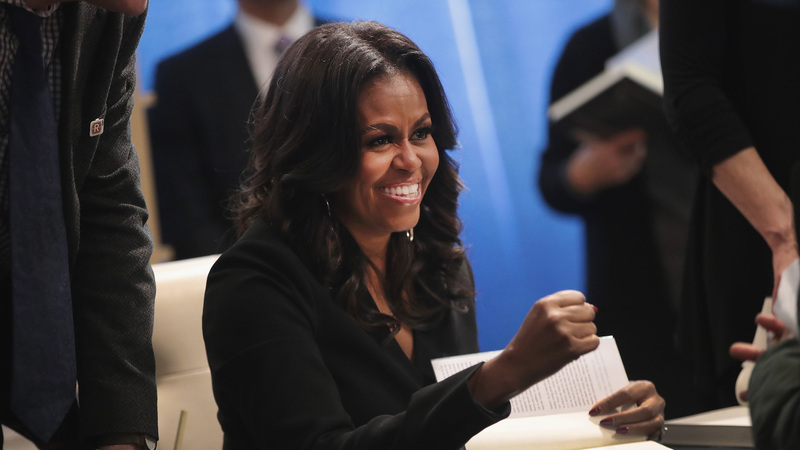 During the eight years that Michelle Obama was the first lady of the United States, for example, there were quite a few phrases you’d never catch her uttering. During her appearance on Jimmy Kimmel Live on Thursday, she hilariously read off several of them, proving that she could hold her own against any famous comedian, Kimmel included. As reported by People, Obama appeared on Kimmel’s show during the promotional tour for her new book, Becoming, which hit shelves on Tuesday. Then the two veered off into a game involving statements he’d written for her to read, much like when he asks celebrities to read mean tweets about themselves. Obama kept the crowd laughing as she dutifully repeated statements that were almost all false and had no real connection to her life. Kimmel commented, “Part of being a parent.” He’s not wrong. We’re also pretty sure that anyone with siblings can relate to their parents calling them the wrong name at least once in their lives. In addition to promoting her new book, Obama has also been touting book-inspired merchandise, including hats, coffee mugs and T-shirts bearing her face. Per Oprah Magazine, the net proceeds from merchandise sales will go directly to the Global Girls Alliance to support its education initiatives through the Obama Foundation. GGA helps more than 98 million girls around the world find and pursue education opportunities to advance their dreams.